It was almost a year since my last travel through the country side of Europe and there I was once more wander lusting after the thrills of being on the road again, having those life changing conversations with near strangers and relaxing by the glistening ocean getting that perfect tan. 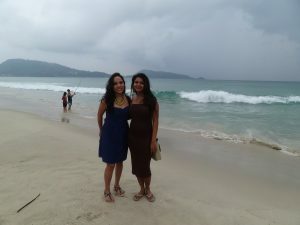 Thailand seemed to be the perfect choice, not too far from India and friendly on the pocket. I grabbed one of my single girlfriends and headed East. 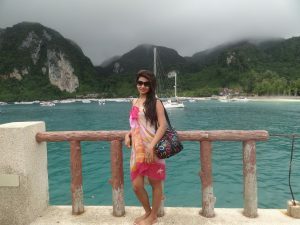 Our first stop was the breath taking, colourful island of Phuket. From the golden sand and turquoise waters of Patong beach, to the night life at Bangla Road, the whole island was a scenic, gorgeous travel destination. Mornings were relaxed, waking up early, having a lavish local breakfast and heading to the beach. For adventure enthusiasts, Patong offers a range of water sports from snorkeling and deep sea diving to para sailing and jet skiing. Away from the shore, the ferry took us, out into the middle of the ocean and down into the water to snorkel, before heading over to Phi Phi. Almost instantly I fell in love with the beauty of this simple island. Nestled about 45 mintues into the Indian ocean away from Patong beach, Phi Phi was one such spot damaged by the 2004 Tsunami. We stopped by a stall selling antiques not to buy any, but to hear about life on the island. The lady, maybe in her mid-40s, worn out by hard life told us in faltering English about the lives lost and the devastation caused. However the will power of its strong people and local development have once more made this little village prosperous and thriving again. Pattaya was quite a disappointment with its dirty streets and overcrowded tourists spots. Its only saving grace was the under-water walk over the sea bed. I was bewitched! Walking along the sea bed, miles into the ocean, touching corals and feeding fish, was my best and only take away from Pattaya. Being someone who enjoys vacays the local way, I sampled as much of the spicy local cuisine as my strong Indian tummy could possibly handle. I gorged on the spicy papaya salad with shrimps which soon became my favorite at every meal, relished on crispy pork and sampled grilled frogs from a street stall. For vegans though, you could have a harder time, since English is not easily understood and almost all dishes contain fish or meat. Make sure to learn a few words in the local language to describe what you can and cannot eat, but make it a point to enjoy the vegan version of the local cuisine, though easier said than done. My friend who was accompanying me on the trip was vegan and definitely had a tough time. While she was supportive of me tying out all possible creatures for dinner, she fed on coconut water and pineapple fruit for a few meals. 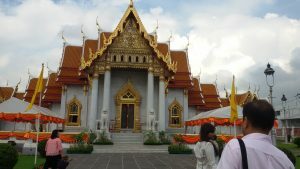 Consider visiting Thailand incase you are vegan and struggling through your weight loss plan. While mornings were spent lazing on the beach and chatting up locals, afternoons were devoted to relaxing in traditional Thai massages. While the authentic Thai massage is a dry massage, I much enjoyed the alternate massages done using fruit lotion and hot oil followed by a shower. With their fingertips pressed all over, digging into each muscle, they eased away all my stress and sent home a blissful customer, each afternoon. Thailand offers numerous party spots to spend the night away drinking, dancing or in the arms of its many friendly women. I absolutely enjoyed the world famous cabaret show – Alcazar, put up by lady boys, whose performances were outstandingly brilliant and would recommend you catch a show as well. Bangla road in Phuket and Walking Street in Pattaya come alive each night with pimps and prostitutes, pole dancers and ping pong shows all vying for a share of the tourists wallet. While Thailand tourism is often known for its wild side, the country has so much more to offer. From its gorgeous landscaped islands, flavorful cuisines, relaxing massages, adventure sports, Buddhist temples and ever friendly locals, Thailand is a country that will make you want to comeback for more. Thailand’s peak season is November to February when the weather is at its best through most of the country. However peak seasons tend to get over crowded with tourists from across the world. October is good time to visit Phuket, when lush green carpets welcome you and the slight drizzle with fewer crowds give you the opportunity to engage more with the locals and experience their culture.